I always like to know how something was made, what was used to build, etc. Maybe this is because I’m an engineer, but I just like to see what’s under the hood. Many companies find that revealing what technologies were used for a site makes it more vulnerable to attacks. Well if that was the case then github, basecamp and many other web applications would be hot spots for hack attempts. For me, if people attempt to hack your application, whether they know what technologies were used or not, its your job to make sure you are well protected, and that those technologies are reliable. Fortunately for us, PangoScrum uses widely used frameworks and plugins such as Rails and jQuery so this is not an issue for us. 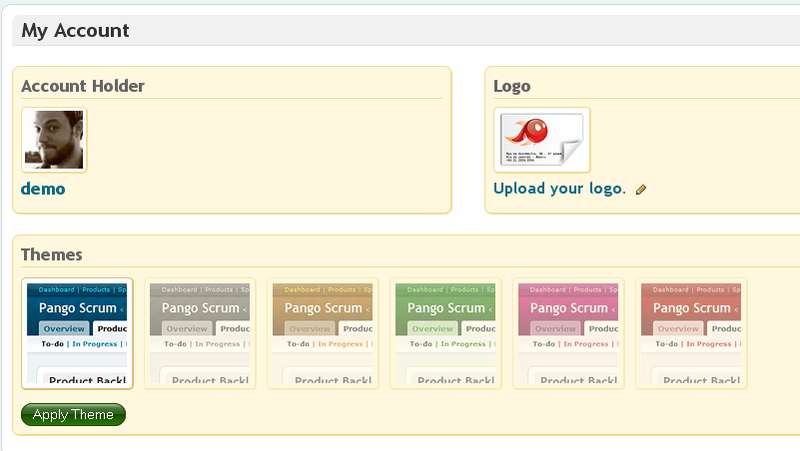 So like I said we’ve made PangoScrum in Rails because it is the best web framework we’ve know. It gives us a lot of functionality in a simple and elegant way. It comes with a bunch of supporting applications and frameworks like RSpec, Cucumber and Capistrano. We used authlogic for authentication, since it was more simple and clean then restful_authentication. Also for validation of dates we used validate_timeliness. In the beginning we were not adept of TDD so didn’t write many tests, only for models. We’ve found later that not having tests was a bad idea. Then came RSpec and writing tests was not painful anymore. So we started writing more tests for what we already had, and then we found ourselves making BDD and having lots of fun. Every new feature would only be added after tests were written and this made us confident that we were delivering good and working software. We are very ansious about Rails 3. 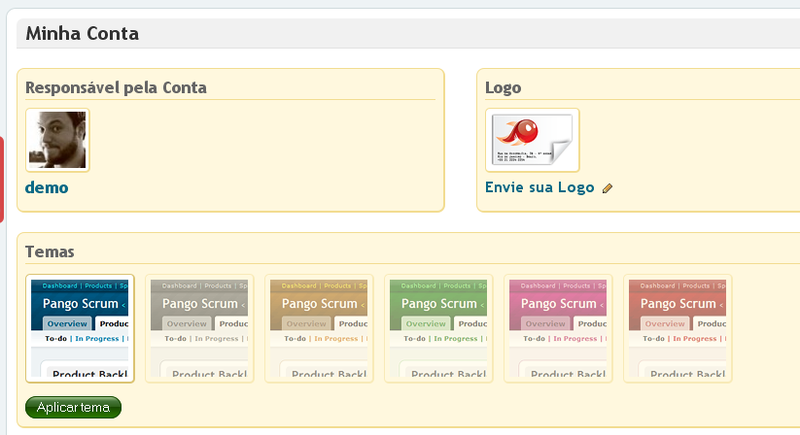 It will be awsome to migrate PangoScrum to Rails 3, even knowing it will be hard. Since we have lots of tests, we wouldn’t have to worry a lot. Also we are very inclined to use some non SQL database such as MongoDB or CouchDB. Both seems very mature and more fast and simple than MySQL which is the current database server we are using. We hope that when the time comes to make this migration MongoMapper and CouchRest are using ActiveModel, so we have a common interface to ActiveRecord. Expect more to come, we are willing to keep improving PangoScrum to better suit our users need! The PangoScrum team has released today a new feature for the community: Branding. 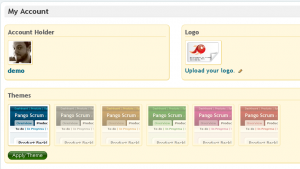 Now you can customize the appearance of your PangoScrum by selecting themes and uploading your logo. Only the Account Holder, that is the account creator, might customize PangoScrum’s appearance. And then you will be able to choose a theme or upload your logo. Added the concept of Account Holder. Normally this will be the collaborator which has created the account. It may not be changed yet. Collaborators created by admins are active by default now. This means that there is no need for those collaborators to access the activate link. Account Holders still need to activate themselves, which means that accounts need to be activated. Collaborators still need to set their passwords before they are able to login. The e-mail sent to collaborators when they are created has been updated to reflect these changes. Password Reset link in edit collaborator form wasn’t working. Logged in collaborators could delete themselves if they were admins. This was fixed, now an error message will be flashed when the logged in collaborator attempts to delete himself. Admin checkbox was not working in both create and update collaborator forms. A equipe PangoScrum liberou hoje uma nova feature para a comunidade: Branding. Agora você poderá personalizar a aparência de seu PangoScrum, selecionando temas e colocando a sua logo na sua conta. Somente o Responsável pela conta, ou seja, o colaborador criador da conta, poderá personalizar a aparência do PangoScrum. Adicionado o conceito de “Responsável pela conta”. Normalmente ele será o colaborador que criou a conta. Este papel não pode ser alterado ainda. Colaboradores criados por administradores estão agora ativados por padrão. Isso significa que não há a necessidade destes colaboradores acessarem a url de ativação. O responsável pela conta ainda precisa se ativar. Colaboradores ainda precisar configurar uma senha antes de logarrem-se. O link de reset de password não estava funcionando. Colaboradores logados podiam excluir-se se eles fossem administradores. A checkbox de admin não estava funcionando tanto na criação quando na edição de colaboradores. Is has been long since Intelitiva adopted the Scrum framework, enjoying all the benefits of the agile Methodology. To manage the Scrum process, we used to use our corporate wiki, putting in there our products, product backlogs, sprints, dates, items states, sprints results and etc. We need this information especially in order to have vision and feedback about the process. Without this feedback, we consider that we would not improve as much as we could our software deliver eficiency. Besides that, it was also interesting to have the historical data about our Scrum, e.g., to know what we delivered to the client in the past five interactions. The inclusion of the information was boring. The information was not structured. We did not have any kind of report. It was difficult to organize and search the history. Finally, the teams did not like to use it and the information that could improve our efficiency was not properly available anywhere. Maybe it would be interesting to use a specific tool for the management of Scrum in Intelitiva. They try to replace the task board. We didn’t want this. They don’t have a friendly interface. They are too complex: They have many features that we don’t need. They would interfere in our Scrum. Maybe other teams also experienced such difficulties. For those reasons we have developed PangoScrum. A Intelitiva utiliza o framework Scrum já há algum tempo, experimentando todos os benefícios da utilização da metodologia ágil. Para gerenciar o processo, utilizávamos nossa wiki interna corporativa, cadastrando nela os produtos, product backlogs, sprints, datas, estados dos items, resultado dos sprints e etc. Precisávamos dessas informações, principalmente, para termos visão e feedback do processo. Sem esse feedback, consideramos que não melhoramos o quanto podemos a nossa eficiência nas entregas de software. Além disso também era interessante ter o histórico de nosso Scrum como, por exemplo, o que nós entregamos para o cliente nas últimas 5 iterações. A inclusão da informação era chata e desestimulante. O acesso à informação não era fácil e muito menos ágil. As informações não eram estruturadas. Não tínhamos nenhum tipo de relatório. Era difícil organizar e pesquisar o histórico. Enfim, as equipes não gostavam de utilizar e as informações que poderiam melhorar a eficiência não eram disponibilizadas adequadamente em nenhum lugar. Talvez seja interessante se utilizássemos uma ferramenta específica para o gerenciamento do Scrum na Intelitiva. Tentavam substituir o quadro de tarefas, algo que não concordávamos. Não tinham interfaces que considerávamos amigáveis. Eram complexas e poluídas: Tinham tantas funcionalidades que nos perdíamos. Talvez outras equipes também experimentassem tais dificuldades. Por este motivos desenvolvemos o PangoScrum. A Intelitiva lançou hoje o PangoScrum Beta, totalmente gratuito e sem limitações de uso. De uma maneira simples e sem interferir no seu Scrum, melhore continuamente sua eficiência nas entregas. Obtenha feedback para tomar as decisões corretas, acessando facilmente as informações relevantes e atualizadas em tempo real. Como você gerencia o backlog de seus produtos? 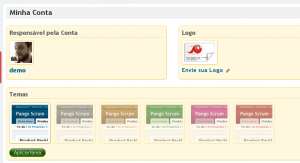 Com PangoScrum você escreverá, estimará e priorizará seu product backlog através de um interface simples e amigável. PangoScrum fará você trabalhar mais rápido. Objetivamente e sem burocracia, seus Sprints serão planejados com maior agilidade. Suas equipes estão alinhadas com um calendário? No PangoScrum as datas de suas reuniões de planning, review e retrospectiva estarão agendadas em um calendário com fácil visualização e acesso. 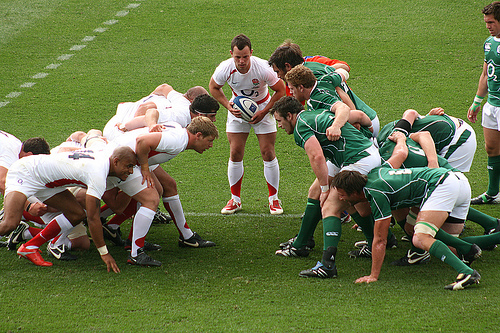 Entregar mais valor para o cliente e reduzir o time-to-market dos produtos: Scrum faz por você. Gerenciar mantendo a simplicidade e agilidade do processo: PangoScrum fará por você. Acesse http://pangoscrum.com e cadastre-se gratuitamente! Seja bem vindo ao blog da PangoScrum!